After more than three years of growth thanks to our dedicated community of volunteers across the world, we would like to highlight some of their stories and projects. Thank you to the ones who agree to share their experience with our readers And thank you to everyone that is involved in Techfugees! Techfugees (TF): Could you please introduce yourself to our readers? My name is a Yama. I am an entrepreneur based at High Tech Campus Eindhoven, The Netherlands, and recently also at Station F, in Paris. I advise companies on strategy & innovation. With some colleagues, we are also developing our own product to provide all working class and marginalised communities. And I also co-lead the Netherlands Chapter of Techfugees which will be officially relaunched soon! I have a refugee background. I found myself in the Netherlands as a refugee at the young age of 12. As much as I hate it, that is a big part of my story. My family and I had to flee the country due to political problems my parents were facing. We went through the asylum procedure fairly quickly. After a short language preparation, I was placed in a Dutch school. After high school, I did a degree in engineering, but it didn’t take long for me to figure out that I wanted to be connected with my roots and be part of the development and reconstruction efforts. That’s why I shifted to study economics and discovered a passion for development studies. After finishing my degree in economics at Tilburg University, I actually drove all the way to Afghanistan to look for my roots and understand the origins of the conflict in my country of birth and make myself useful there. Afghanistan has been at war for the past 40 years. Due to this, there has been a tremendous amount of ‘brain drain’, as more than 10 million people have been displaced. Before we fled, my dad was an engineer and army officer and my mom was a professor in veterinary medicine at Kabul University. As a young economist, I was interested in economic development and the industrialisation of nations. I worked in development assistance with civil society in places such as Afghanistan, Kosovo and the Democratic Republic of Congo. There I learned a lot about the challenges the government and non-government institutions are facing in fragile states. The traditional aid model has utterly failed. Also, I saw about the importance of private sector development and the role of diasporas to contribute to this in collaboration with government and knowledge institutions. For this we need entrepreneurial-oriented diasporas with strong ties in the host country and in the country of origin. Technology is just a great medium to leverage on. TF: Can you remember and tell us the first time you held a technological tool in your hands? What was it? What did you do with it? How did you feel? What did you think? I do remember seeing and touching the first computer when I was 12. It was at the public library in Nederweert. In those days, the Internet went through 56k modems and it was quite expensive. As a young kid from refugee decent, I just could not afford it. I knew already then, that computers were going to be important and that playing with them would give me a head start in life. In the same library I went on reading books about computers and soon I figured out how to access to the system and use the Internet without paying. Obviously, I got caught eventually, cause the library lady didn’t understand how I could be on the Internet while I haven’t paid. She was nice though, after hearing me out on my motivation, she allowed me to continue. TF: How did you hear about Techfugees? 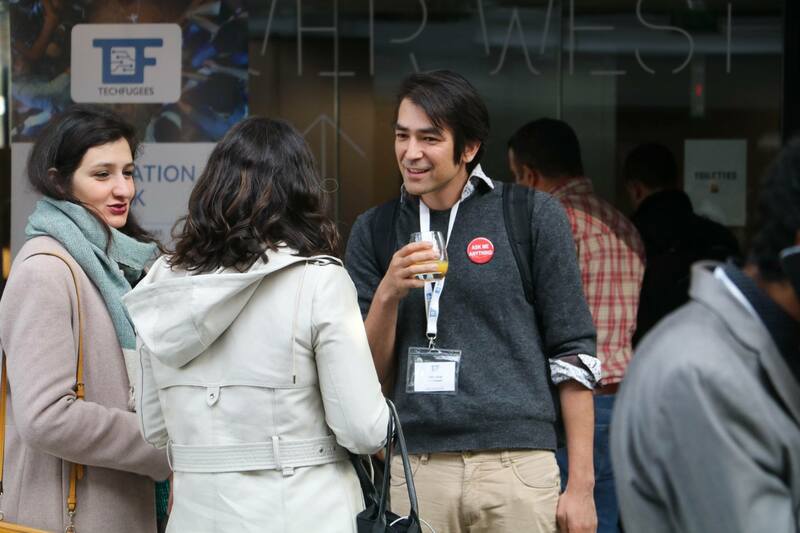 TF: How have you been engaging with the Techfugees community so far? Which event did you attend or which programme did you get involved with? We’ve already had events in the Netherlands. Then I attended the Techfugees Global Summit 2018 in Paris. TF: What did (or does) it change in your life or how does it change it? TF: Could you please let us know more about your current project? First of all, we are setting up the Techfugees Chapter of Eindhoven in the Netherlands, to advocate for inclusive technology and generate technology solutions to empower refugees. Aside from this, I am very excited to be working on my startup, Sensai. For this project I joined the Fighters Program of Station F. We aim to bring mental and physical wellbeing training through sports for youngsters in displaced and marginalised communities. For this, we are developing a DIY (do it yourself) educational kit to teach kids about healthy lifestyle & electronics. We are working on this with students from Harvard and Technical University of Eindhoven. TF: How can our readers help you? What are you looking for now that you would like to share with the Techfugees community? Obviously for setting up the Techfugees’ chapter we are looking for enthusiastic people who could help us with the set up. Newcomers to our city, meaning not only refugees but also skilled knowledge migrants who work in our semiconductor industry need to take part in the social fabric of our society. We aim to organise a hackathon by the end of May 2019 at the public library of Eindhoven. They could teach and share skills with each other. Another important topic is job participation of refugees. Rather than for refugees, I would like to organise this in cooperation with refugees and former refugees like myself who gradually developed themselves. TF: A piece of advice to share with someone who is considering to take part in the Techfugees community? Just be the change you want to see around the world! Do you want to volunteer in Techfugees’ Chapter in the Netherlands? Come explore a day in 2084 with Techfugees’ CEO!Where & when meet Techfugees’ ambassadors?